Juanderlust Be The Chosen Juan ~ Philippine Freebies, Promos, Contests and MORE! 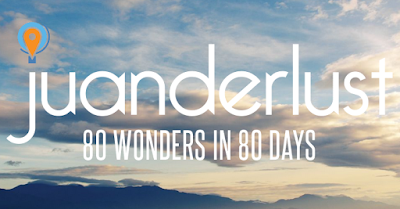 To show the untapped potential of our country to the global community through our culture, people, and undiscovered sites, TravelBook.ph, a local hotel booking site, and StopSleepGo, a U.K.based vacation rental booking site, launches the Juanderlust competition. It is a new global online search for the Chosen Juan who will travel and have an exhilirating adventure around the country for 80 days and share it with the world. Aside from that, you will also get gadgets and a juicy compensation package after the journey. That's almost P2.5 million worth of prizes! To join, register online and answer the question, "Why should you become the Chosen Juan?" in an essay and audition video. Upload it upon registration. All participants will be trimmed down to 100 and will receive another test of skill by answering "Tell us about yourself and your travels and why you should be the new travel voice of the Philippines." The Top 10 Hopeful Juans will be completed by the 9 shortlisted participants and 1 from wildcard selection. You will each have to pack your bags, visit a nearby destination and stay there overnight. Create a great writeup about your wonderful experience attached with photos and get a chance to be the Chosen Juan. That's it! It's a fun and exciting experience you don't want to miss. Answer the question, "Why should you become the Chosen Juan?" All Top 10 Hopeful Juans will each have to pack your bags and visit a nearby destination and stay there overnight. Accommodations, full board meals, and per diem shall be provided by TravelBook and StopSleepGo. 50% Content - Is your answer relevant and engaging? 50% Creativity - Is your answer original and innovative? 40% Content - Did you answer the question in the most engaging and best possible way? 35% Creativity - Does your answer have the power to claim the attention of our judges? 25% Production - Did you give your video 150% effort? 50% Content - Is your essay meaty and relevant? 25% Creativity - Is your essay unique and original? 25% Writing Skills - Do you have an engaging writing style and a good grasp of grammar? 50% Content - Is your content meaty and relevant? 25% Creativity - Is your post unique and original?